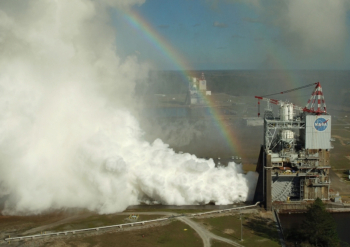 The RS-25 engine team has performed the latest hot-fire test in the A-1 test stand at the Stennis Space Center in Mississippi on Tuesday. 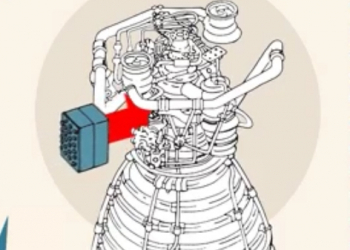 NASA, RS-25 prime contractor Aerojet Rocketdyne, and Stennis facilities contractor Syncom Space Services (S3) are attempting acceptance testing the second engine controller unit (ECU) slated to fly on the first launch of NASA’s SLS launch vehicle. The Honeywell ECU is bolted and wired onto Development Engine 0528 (E0528), which is being used for the current hot-fire test series. Philip Benefield, Systems and Requirements Team Lead for the SLS Liquid Engines Office, said in an email that the primary objective for this test is to acceptance test (or “green run”) the FM3 flight model ECU. Each engine has a dedicated, self-redundant controller unit that controls its operation, monitors its health, and communicates with the launch vehicle flight computers. The test team at Stennis attempted the test last week, with a planned duration of 500 seconds, which is the approximate operating time of the RS-25 engines for SLS launches. However, the test was delayed due to a facility issue associated with Fuel Run Tank pressure control. After several hours of working the issue, the team finally announced they had scrubbed. The rescheduled attempt on Tuesday was neither advertised or broadcast. However, L2 coverage confirmed the firing and the successful 500 seconds duration of the test that began at 2:43 pm Central Time. During the test, once rescheduled, Benefield said the engine will be throttled at thrust levels between 80 percent of rated power level (RPL) and 111 percent. As with the throttle profile for launches, the majority of the run time today will be at 109 percent. The last hot-fire test on March 23 was a green run of the FM2 controller. “FM2 performed well. All ‘Green Run’ test criteria were met,” Benefield noted. Following that test, FM2 was removed from E0528 in the stand and taken to Aerojet Rocketdyne’s facility at Stennis, where it is being inspected for eventual installation on flight engine 2045. In parallel, FM3 was delivered to Stennis from Honeywell’s Clearwater, Florida facility and took FM2’s place on the test engine to begin preparations for today’s test. The ECU tested today is assigned to eventually fly with flight engine 2056. Originally developed in the 1970s for the Space Shuttle Program when it was known as the Space Shuttle Main Engine (SSME), RS-25 hot-fire testing began at Stennis in January, 2015, to demonstrate and certify engine operation at the higher performance levels for SLS. SLS is both physically longer and at times will accelerate faster during launch than Shuttle did, requiring different starting and running inlet conditions for the engines through powered flight. Each test is designed to meet several test objectives, and although it is primarily a green run of the ECU, today’s test will also continue final verification of SLS program requirements. One the other objectives of the test is to continue to demonstrate that the engine can start satisfactorily in a range of temperature and pressure conditions at its inlet. Benefield noted that the engine will be started today with “poor combustion conditions” — higher than normal LOX temperatures and lower than normal LOX pressures. The hot-fire will be the sixth in a test series with E0528 that began in July of last year. So far, a total of thirteen tests have been conducted using both development engines (E0525 and E0528) and one flight engine retained from the Shuttle Program. Up until the test in March, all prior RS-25 tests used an engineering model of the new controller. Certification of the new control system and controller also involves lab testing at Marshall Space Flight Center in Huntsville, Alabama, and at Aerojet Rocketdyne and Honeywell facilities in other parts of the United States. Production of flight engine controllers continues at Honeywell and most of the new units will be rotated onto E0528 on the test stand for individual green run tests before being integrated into the existing engine inventory at Aerojet Rocketdyne. 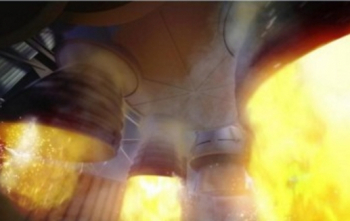 Current plans call for the next RS-25 hot-fire test in early July. In addition to the ECU green run hot-fire tests, two flight engines that were assembled and added to the inventory are still planned to be green run. E2062 and E2063 have never been hot-fired as an integrated unit and so will get their green run tests as more flight ECUs become available. One of the certification requirements is to demonstrate run time on a flight engine and the full engine green run tests later this year will help meet that. E2062 and E2063 are currently assigned to the second SLS Core Stage, but will also serve as program spares in the meantime. The engines designated for the first SLS launch (E2045, E2056, E2058, and E2060) will get an additional pre-launch test firing together in a green run of the completed Core Stage; that test will occur on the nearby B-2 test stand at Stennis. 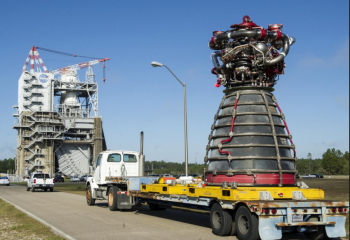 After the engines are integrated with their flight controllers at Stennis, they will be transported to the Michoud Assembly Facility in New Orleans for installation into the stage during final assembly.